Gone are the days when getting a dog treat for your dog meant going to the local grocery store and picking up a box of Milk Bones. Nowadays, there’s a much, much larger selection of dog treats to choose from. The problem is, some of these dog treats may not just be unhealthy for your dog -- they can actually kill your beloved pet. To understand how rawhide could be dangerous, it’s important to first understand what rawhide is. Rawhide is the skin of a cow. Now it’s also important to understand that the production of rawhide is not monitored in any way, so what you see isn’t necessarily always what you get. Once there was a problem with arsenic tainting rawhide. Other rawhide shipments have been found with formaldehyde traces. Do you really want your dog ingesting these chemicals? Rawhide can also cause intestinal blockage problems and can actually damage the inside of your dog’s intestines. With all of the dog treats available on the market, there’s no reason to give your dog a rawhide treat. Like rawhide, pigs ears and cow hooves have been known to cause intestinal issues in dogs. From vomiting and diarrhea to irritation and blockages, there are a number of reasons why pig ears and cow hooves aren’t the best dog treats for your dog. Like rawhide, pigs ears and cow hooves, Greenies have been known to cause intestinal problems. If the Greenies treat isn’t properly chewed by the dog, the treat can block the intestine, causing illness and death. Greenies are popular treats and millions have been sold, and while only a few cases of death or serious injury have been reported, it’s best to err on the side of caution. While it’s true that anything that your dog ingests could pose a potential threat, there are safer dog treats out there on the market. Simple, easy-to-digest and chew treats like Milk Bones and other doggie crackers are a great alternative to the more dangerous dog treats. The next time you go shopping for dog treats, keep this in mind and your dog will thank you for it later. I have heard many times that Greenies are hard to digest, if it is not chew properly... so if anyone of you that are giving greenies as treat, please check if your dogs chew properly oh! 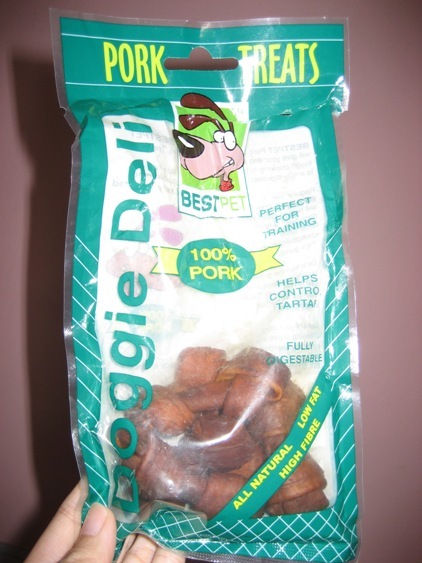 i don't dare to buy treats for my furkids anymore,everytime i give them treats,their poo will be so smelly that i cant stand of it anymore,so no more treats for them already..
yenlu, is this the one not good for dog??? ops...it seems like the picture too big...how can i edit it bcome smaller??? Rawhide is cured animal hide shaped into various objects. Though they tend not to last very long, dogs often take to them as a cat takes to catnip. But many dog owners and veterinarians have reported problems associated with use of rawhide toys and chews, such as stomach upset and intestinal blockage. In addition, rawhides soften when chewed and can lodge in a dog's throat. If you give rawhides to your dog, supervise and immediately remove the item if the dog is getting too intense and/or ingesting more than a little at a time. Rawhide bones, pig-hooves and other highly coveted treats can incite a dog to guard or attack an approaching dog or person in order to protect his prize. So these are not good choices for multiple pet situations, or for dogs prone to resource guarding. Layers of rawhide pressed into tougher bones and shapes that last longer than the flat and rolled rawhides. In addition to providing a longer-lasting chew, pressed rawhide is typically safer than regular rawhide since it disintegrates. However, it can still be reduced to small chunks that can choke a dog. Also, pressed rawhide can make a mess if left on furniture or rugs. If you do buy rawhides, get ones made in the United States or another country that regulates processing. Rawhides made elsewhere may contain harmful chemicals used in processing. but you give greenies rite? Do they chew slowly, or just break into pieces and swallow? =X If swalow, it can't be digest well... somemore if they swallow then the purpose of greenie to brush teeth also no use LOL..
Then good lor... I dun dare giv my miki cause ah, she will swallow one haha.. *i think* cause the treats (biscuit) I gave her, big piece, she will bite into smaller pieces and finish within seconds, like no need chew.. This brand not sure good or not.any idea? ?Yenlu, why not u share with us what u feed Miki n sushi?? Jerhigh, Bow-wow, Japanese Milk Biscuit, Iam Puppy..
After review the ingredient in a few dog biscuit, I find out that Avoderm has quite nice ingredient. Read up here. Sushi, will diarhea if consume more then a small bite of Iam Puppy Biscuit... LOLz.. but Miki loves Iam.. =) Still prefer Avoderm in term of price and size! Another brand of biscuit that I have wanted to try, but not yet.. is Zinpro Dog Biscuit. Heard it is nice for skin and coat. Quite expensive if you compare to other biscuits, but Zinpro is more like a supplement. Most dog biscuits cannot consume too much in a day, be sure to read the instruction at the packaging. When i take this pork bone bone out to take picture last nite, Amos jump jump there then no choice i give him..but usually he wil bite into many small piece, then i will throw..just for him to bite.. I bought one BIG pork bone same brand as u but is BIG size one...that one boyboy can chew chew but if he able to tear off, he will eat it also...this one showing fully digestable, it should be no problem rite? my dog never swallow wor, can bite till ver small pieces. guess he just enjoy chewing on it. Dr3aMCuT|3 wrote: I bought one BIG pork bone same brand as u but is BIG size one...that one boyboy can chew chew but if he able to tear off, he will eat it also...this one showing fully digestable, it should be no problem rite? Although they write fully digestable, but they do not specify if it is eaten in big or small chunk... to be on safe side, when it is soften, just cut away the soften part. it wil be harden back after it dries....if seems no more taste already then i throw..Amos liam liam chew chew only..dun eat 1.. So in that case, remove till it hardens back? :p I never buy those rawhide, just got them some nylon bone..
no la i din bother...it will harden back..cos he will bite into many piece, sekejap chew this piece sekejap chew other piece..those not being chew become harden back...i just throw if those rawhide is more than few days or 1 week. i think he din eat it. hahaa..bobo so nottie!! !nx time u keep at place where he cant reach la..usually i keep it one..Amos cant reach..